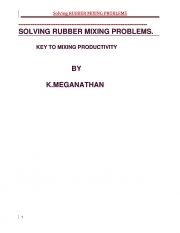 Description of "Solving Rubber Mixing Problems (eBook)"
This book is an attempt to meet one such need. Many of the ideas outlined in this book are already known to the RUBBER MIXING INDUSTRY. The purpose of this Book is to PUBLISH these ideas in a compiled form for the benefit of middle level and entry level Mixing Managers. The author, having worked in a leading tyre company in INDIA for four Decades, has considerable experience in solving Mixing problems.The author’s Mixing knowledge is built on decades of shop floor Experience,voracious reading of books/magazines; attending and going through gl1obal seminars/ papers; taking classes for graduate rubber technology students,;presenting numerous papers on mixing improvements in internal conferences. he author had the good fortune to benefit from association /interaction with global mixing experts/ global mixing machinery suppliers/ important raw material suppliers. This book is an attempt to share the author’s accumulated knowledge. Reviews of "Solving Rubber Mixing Problems (eBook)"